Shower renovation specialist and tile installation experts. KB Interiors is a business built on experience, upholding integrity, and expressing our passion through our work. 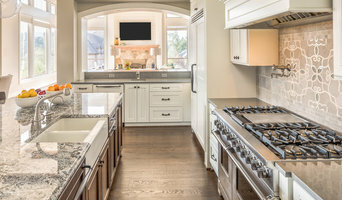 Founded by Kamey Berringer, KB Interiors is one of Dallas Fort Worth's premier Kitchen and Bath Design businesses providing the connection between cost, functionality, smart design, and unique style. We specialize in... + Kitchens + Bathrooms + Cabinetry & Refacing + Design Services Kamey Berringer is an accomplished Kitchen & Bath Design Specialist whose passion in design and attention to detail have positioned her as one of the best. Kamey established KB Interiors to help clients transform their space into a room that fits a specific need, while also showcasing individual style. Each project receives her personal signature of sophistication and innovative simplicity. With her education in Interior Design and over 15 years experience, Kamey's strength is her ability to create a seamless transition between design and installation. Her trademark style can be seen through her modern use of texture, layers, color, and light, creating environments in which people love to live. JC Custom Remodeling is a full service contracting company for all of your kitchen and bathroom remodeling and home additions with over 18 years of experience. We are a full service remodeling company dedicated to providing all of our clients the absolute best in high quality professional renovations. From the design process through the completion of the renovations themselves, our experienced technicians will ensure that your project is completed with quality and efficiency. Most importantly, WE CARE about the end result of our jobs and whether they reflect our dedication to quality service while fulfilling your requests. Our staff forms a unified family of camaraderie that lives and breathes our jobs while creating the results we would be proud to have in our own homes. With employees who have been with us for 6+ years and a dedicated client base, we are sure you will have a fantastic experience when working with JC Custom Remodeling. Offering over three decades of experience! 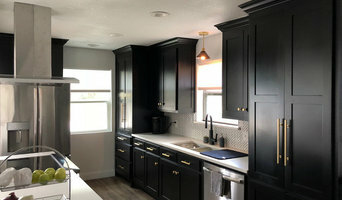 Chip's Cabinets aka Chip's Kitchens & Bath has been building custom cabinets, renovating kitchens, bathrooms and other rooms in homes and offices throughout North Texas since 1976. We utilize the best materials available, and we are proud to work with SUPERIOR VENDORS AND PARTNERS. All of our cabinets are solid wood or plywood, including all interior shelves. We custom design your kitchen or bathroom and use only hand-built cabinetry constructed locally in the DFW Metroplex. Unlike the competition, we complete all cabinets in controlled environments for hand finishing, assuring you of custom cabinetry for your project. Work begins only after you have approved your design Our design software allows you to take a virtual tour and view the entire room before renovation begins. Once you see our preliminary design, we can make changes quickly. Chip personally measures every job, then works with you to design your dream kitchen, office, entertainment room or bathroom. Once you've approved the plans, we take over seamlessly to ensure your peace of mind from inception to completion, keeping to both time and budget. We specialize in complete remodel projects from top to bottom Because all of our work is custom, you can choose the design of your room, the colors, the floor, the countertops and wall finishes. After your choices are made, leave it to our team of artisans and craftsmen. We will handle the entire project, saving you time, money and aggravation. Experienced home remodeling and design firm, serving Tarrant County and the surrounding area. We specialize in Bathroom and Kitchen remodels. Contact us for all your home remodeling needs! We look forward to working with you to turn your space into your dream home. Kitchen & Bath Remodeler offering nationally recognized Cabinet Lines. We can also provide Countertops (Granite, Quartz, Laminate, Wood), Tile, Laminate, Vinyl and Wood Floors, Backsplashes & Showers, Texture, Paint, Shower Doors, Cabinet Hardware, Window Treatments (Shutters, Blinds, Cellular Shades), Cabinet Interior Accessories, Closets, Plumbing Fixtures. 40 years experience in the industry. 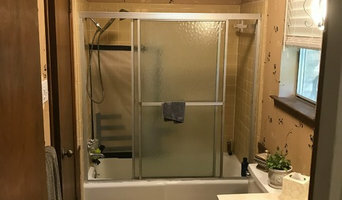 Bath and shower area Remodeling. Installation of Hydro Dimensions Walk in tubs. Offering custom tile, The Onyx Collection, and Bella Stone Acrylic shower enclosures. The Onyx Collection is a high quality product that is GUARANTEED FOREVER and is available in a ton of different colors and can be custom fit. We can install Onyx shower pans, walls, vanity tops as well as accessories and a full compliment of ADA options including roll in shower pans complete with seats and grab bars. An architect partner available to assist in the tougher design elements if needed. Grand total of over 80 years experience in home remodeling and improvements. Offering $1000 cash back financing as well as up to 18 months no interest and and we accept all credit cards. Check out our website for pre approval with no affect on your credit score. Scroll down to Hearth icon and get started. 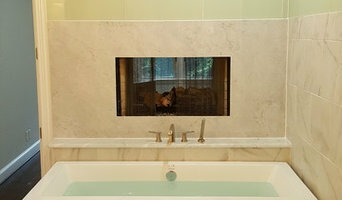 What does an Arlington kitchen and bath remodeling expert do? Licensed Texas kitchen and bath remodelers are contractors who specialize in altering the structure of an existing space, rather than building one from the ground up. Because he or she must deal with a previous builder’s work, the job can get more complicated than new construction. You might wonder why they often specialize in both kitchens and bathrooms, but if you think about those two spaces, they actually have a lot in common. Kitchens and bathrooms include an abundance of fixtures that require careful planning and installation, including sinks, faucets, tubs and toilets that all need water hookups and drainage. They also use similar materials, such as tile and stone for countertops and flooring, due to the nature of their use. So it makes sense that Arlington kitchen remodelers and bathroom remodelers be one in the same. A bathroom or kitchen remodeler translates architectural plans from page to reality; some are also trained to provide design services so that you don’t have to hire a separate pro. Like a general contractor, a kitchen and bathroom remodeler in Arlington, TX is responsible for hiring and supervising subcontractors and providing materials when necessary. They also should have a thorough knowledge of Texas building codes and construction-related legal issues, as well as current design and product trends. Here are some related professionals and vendors to complement the work of kitchen & bath remodelers: Woodworkers & Carpenters, Kitchen & Bath Designers, Interior Designers & Decorators, Architects & Building Designers, General Contractors. 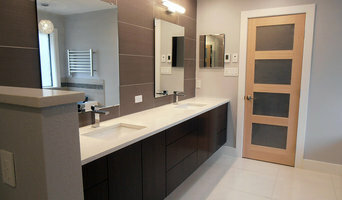 Find an Arlington kitchen and bathroom renovator on Houzz. Narrow your search in the Professionals section of the website to kitchen and bathroom remodelers in Arlington, TX. You may also look through photos of Arlington, TX spaces to find kitchens or bathrooms you like, then contact the bathroom or kitchen remodeler who worked on it.